Adventure Tours is a Wordpress theme developed for travel agencies and tour operators of any size. It offers a lot of flexibility and possibilities in setting up tours. You can indicate as many tour attributes as you like. These attributes can later be used for setting up a search form. Tour rating system allows your customers to rate the tours. Tours come with a flexible booking system which allows setting up tour dates by periods. If a tour runs regularly one month and then on some specific dates, there is no need to create additional tours, all can be set up in one. You can also indicate a number of tickets for each period of one tour. 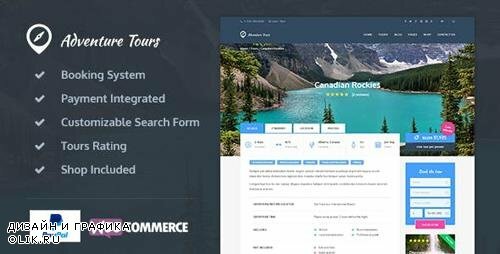 Adventure Tours theme is integrated with famous shopping plugin—WooCommerce. Therefore, it is possible to pay for tours with Paypal and other payment services provided by WooCommerce. Also, you can set up and manage a shop to sell various products. Among other benefits of the theme are a lot of theme appearance customization options, modern responsive and retina ready design, W3C’s validated code, Revolution Slider (of $19), Mailchimp integration for subscriptions, FAQ page, and more. Extensive documentation has been written to make setting up and customizing theme easy and pleasant. In addition, our team provides support for the item, and will gladly help in case you have any questions.